Getting up these mountains in Northern Laos have reduced us to half emptying shampoo bottles and cutting our toothbrushes in half. Well, not quite that bad yet, but not far off. Just 100 miles now from crossing over the border into China. Anyone particularly squeamish on animal welfare might want to skip this vlog. There are no blood or guts, but the suggestion of the images is quite distressing. And as someone who gets pretty upset at cruelty towards animals I've found it the most difficult video to edit and post thus far. I thought about honing it down somewhat or not publishing it at all, but I then reminded myself that this vlog is all about giving you, the viewer, the opportunity to step into a part of the world you might not otherwise get a chance to experience at first hand. And while there are certainly more appetizing aspects of local environments and cultures to share with you - such as the scenery, the wildlife, and the people themselves - what the locals eat is definitely a part of the tapestry that builds a clearer picture of how life is. 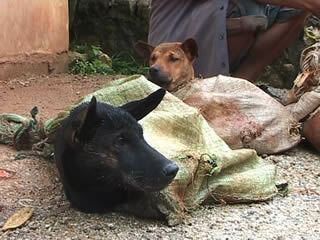 I think what makes it especially hard in this case is the obvious faith the animals have in their captor. Unlike wild animals hunted on more equal terms in their native environment, domesticated dogs clearly have a degree of deference and loyalty to humans that makes the story rather more tragic. Even Melissa, who being Chinese prides herself on eating 'anything that can swim, fly or run', found herself being taken aback. On the flip side one has to remember that although some dogs are considered pets here in Laos, and clearly receive better treatment than others, the vast majority are left to their own devices as scavengers. And in the mountain areas, where people are poorer than in the lowland areas and protein is scarce, a dog is just another animal - like a pig or a goat - living alongside humans but considered a perfectly acceptable source of nutrition when the need arises. When we left Vang Vieng we knew we'd be encountering some grades, but neither of us had any idea of the scale of what really lay ahead. The last three days have been some of the toughest days on a bicycle that I've personally ever experienced. Taking into account the rise and fall in elevation I'd estimate we've pulled about around 5,000 metres (16,000 feet) to get to Luang Prabang where we are now (back down on the River Mekong). 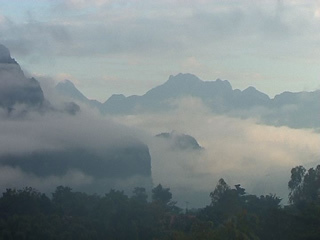 But the payoff has been the utterly spectacular scenery and exposure to some of the more isolated peoples that inhabit the highland regions of northern Laos. Historically these folk have deliberately chosen the mountains for the cooler temperatures and distance from the interfering hands of outside powers, including most recently the French. The road that we've just ridden was unpaved until comparatively recently and targeted by rebel 'Issarak' bandits looking to make life as hard as possible for the supply convoys feeding the northerly provinces. The legacy of this is evident in the rather cool reception we've received by khaki-clad men walking down the road wielding homemade rifles that look like they've been cobbled together out the back of a plumbing store. Take away the sealed road and the regular traffic and it wouldn't take a great leap of imagination to be transported back to the way it used to be just 60 years ago. We've received the exact opposite response from the children who, without fail and en masse, descend upon us in every village like a swarm of nats with the chorus 'Sa Bai Dee' (meaning 'hello') repeated over and over until a response is given. Some are primed to beg for money with open palms, but are not the least bit put out when given a firm refusal. They settle instead for running alongside the bikes, screaming at the top of their voices and attempting to pull off any loose gear that their grimey little hands can reach. All executed with beautific, toothless smiles that can't help but make one laugh regardless of what the little tykes have got away with. We really don't know what to make of today. We took the wrong turn while leaving Vientiane and wound up somewhere just before Phon Hong. It was way too hot and we called it a day in this really weird place. The speed today was not fantastic, averaging only 15.8km. No wonder Jason can joke about how I can leave my helmet alone lest “some cow dashes out” to disrupt my ride. Right. There was unexpected stuff like lots of padi fields, buffaloes, little girls fishing in the fields, rice planting by Jason (who now is considering it as a 2nd career, since he did grow up as a farmer's boy after all) and this... We were at a river crossing unexpectedly and took a ferry ride across the Mekong. Not before Jason had devised a plan in his head – to make sure the human-powered aspect of this whole expedition is being covered. When we arrived on the opposite shore, he parked his bike, took off his sandals and shirt. That was when I realised that he was going to SWIM! SWIM ACROSS THE MEKONG RIVER AH! It was around like 350m at most. But well, the flow of the river was a bit on the fast side. I tried to come up with some kind of a make-shift back-up plan. 1. Fido – the rescue dog. There was this stray that was just right there at the ferry point. I swear that I can throw the darn dog and get it to doggy-paddle back with Jason if things screw up. 2. That gigantic water bottle. It was large and probably can float well. I was trying to look for a flotation device of sorts to toss to him. 3. Me. I actually hold a Bronze Medallion certificate. Newly minted, newly issued. I should be able to do it... IN A SWIMMING POOL LAH! Haiyah, cannot expect too much out of me. I did try to swim across a Brunei river when OB was there last year for its staff expedition, only to be nearly flushed down the river into some crocodile-infested zone. So between my 3 options, I guess the best bet had to be Fido. I was eyeing the dog, right there. Fortunately, Jason survived the swim and lived to tell. I told him the next time round, my hands would be firmly on Fido and the eyes on him! And I promise to devise a better backup plan of sorts as well. 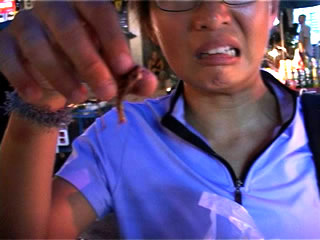 Today's vlog documents our last meal in Thailand; about as baffling as the first one I had nearly a month ago after crossing over from Malaysia. 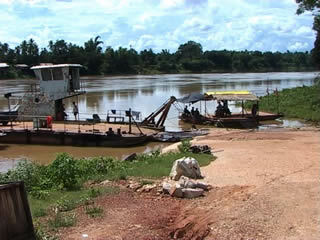 We crossed over the Mekong River into Laos today, reaching the Laotian capital Vientiane by midday. Melissa has done incredibly well since continuing from Khon Kaen the day before yesterday. On her first day out she rode 120kms to Udon Thani with her knees still bandaged and bleeding. Today was a relatively easy one by comparison - just 80kms - but we experienced our first taste of gravel roads (the first of many for sure) riding the main arterial road leading into Vientiane from the border. Good work Melissa - I'm proud of you! Vientiane is a shambles, and I love it. The main drag is completely dug up for road maintenance and if we didn't have a map to tell us otherwise I could swear we'd just stumbled upon a building site in some backwater provincial town. But there's the French colonial influence in the architecture, which lends a certain romantic appeal. Add to that red wine, cheese and baguettes. So no more rice for 24 hours - oh joy! 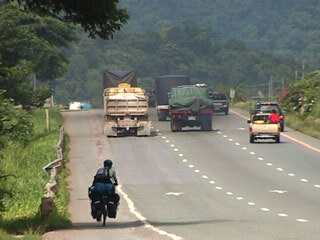 Tomorrow we ride out of Khon Kaen together north towards Udon Thani, 120kms away. 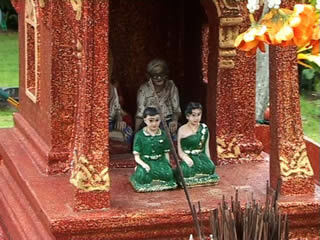 On the ride up here from Pak Chong I took some footage of 'spirit houses' that you'll see in the video. Although most Thais are Buddhists, they are deeply superstitious and still very much tied to their animist roots as most people seem to be in SE Asia. So every place, including physical features in the landscape like rock formations, rivers and even trees, are inhabited by spirits or 'Phi' as they are known. When a house or some other structure is built it is imperative that a separate residence is built somewhere nearby for the evicted spirit to live, otherwise the Phi can wreak all kinds of havoc! These Phi-residences are not very big - normally the size of a doll's house - and are mass produced in uniform style and sold by the road side in large scale Phi-lots. Even the sky scrapers in Bangkok have spirit houses located prominently out front. And the bigger the building, the bigger the spirit house has to be. So as you can imagine some of them get to be mini Taj Mahal's in their own right. Melissa and I met up this afternoon here in Khon Kaen, the largest town before the border with Laos. Two days ago she'd caught a bus from Pak Chong (where the accident was) and kindly waited here for me to catch up by bike. The wounds around her face seem to be healing well, ditto her right shoulder (that to my mind was the biggest worry for being able to continue). But it's actually her knees that are taking the longest to heal. 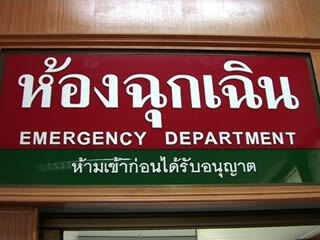 The current plan is to head out of here Monday morning to Udon Thani, 120 kms north of here. Even if we only make it a few kms down the road I think it would be good for Melissa's morale to be out pedaling again. She must be going stir-crazy waiting around in dingy hotel rooms for nature to take its sweet merry time! Poor woman - she's had a such a rotten start to her trip that everything from here must be downhill ('scuse the pun). Things always seem to go bad either at the beginning of a journey (when one is still working out the ropes), or at the end (when complacency has set in), so hopefully she's through the worst of it now. I greatly admire her upbeat attitude and determination so delaying a few more days if need b is a small price to pay for keeping someone of such caliber on board. Good news. Melissa is now out of hospital and recovering in a hotel room here in Pak Chong. Aside from extensive road rash on her face, arms and legs, the worst injuries she sustained were stitches to the left side of her head where a large piece of gravel was embedded, and a possible torn right shoulder. Not disastrous, as in having to book a flight home (or worse! ), but enough to put her out of action for at least 5-days to allow healing to take place. I feel bad for her. I know I'd feel the same in her position that she's 'letting the side down'. I try to impress upon her that stuff like this happens and it's just bad luck that it's come so early into the trip for her. But she seems intent upon punishing herself with guilt. I'm just happy that it's not me that's in the hospital for change! We're currently entertaining the plan of her catching a bus up to Udon Thani near the border with Laos so she can get 3-4 days recuperating while I catch up by bike. We'll see how well she's recovering and make a decision later today. Yes, I'm busted. Quite literally. About 9am, 9km off Pak Chong (small small town about 80km from NKR), I was thrown off my bike. The hill was pretty steep and long. I wasn't careful enough and rolled down the hill too quickly. I kept trying to engage my brakes, the speed got worse and worse. I couldn't brake and got thrown off the bike. Now my face is all smashed and bruised from the fall. Thank God for the lesson that Kennieth from work once taught me... He insists on wearing his helmet every time that he bikes. I wore my helmet and its smashed on the right side now. It probably saved my life. The rest of my body parts are pretty much ok, minus the majorly big scrapes on both my thighs and right elbow. Looks like I've beaten Chu'ai (from work) to the records of largest “bah kwa”. It was pretty painful initially. I cried and cried in pain and shock. At least for an hour solid till they shot me with painkillers (probably morphine) in the hospital. Well, for the record, I had 3 stitches on the left side of my face. A large piece of gravel got stuck between my helmet and my head. If not for the helmet, I would have died. Jason's been great so far, taking very good care of this bashed and bruised team-mate. He's actually out trying to get my bike computer replaced. It was smashed along side with an inner tube that was ripped about 6 inches long. A can of my “celebrations only” Coca Cola was smashed as well and it splattered all over my handlebar bag. We biked out of Ayutthaya on time today at around 5.45am, which is when its first light in Thailand. It wasn't too bad getting out of Ayutthaya and I swear that I was biking at around 25km/h after plugging onto my MP3 player. Music is every bit a source of motivation for me. But after a while, it just didn't quite work anymore. The hills got hiller and hiller. Its like 30 degrees slope for about 300 to 400m. I climbed the first 2 hills with a couple of stops, cos it was just super hot (like 39 degrees celsius recorded on my Suunto Vector). By the 3rd hill, I just had to stop. There was a nice little dingy sidewalk food stall. We sat there and I had like 2 Fanta oranges, besides 1 full litre of water after. Jason had like 3 beers to go even! That's how hot it was out there. After sitting there for about half an hour, there was an excellent proposition to just eat there. Which was GOOD, cos the 2 ladies who run that joint really can cook a mean fried rice. Either that or I've actually gone beyond starvation stage 1. The homestay appeared. Man, am I glad to see it. Today, we've done 96.75km. Location now: Muaklek (a small town 30km off Saraburi). Time taken: 5 hours 36 minutes. In 1973 Father Joe Maier settled in the slum area of Klong Toey, renowned as the 'slaugherhouse' district of Bangkok where thousands of pigs are butchered each day for the capital's kitchens. Over the past 30 years he has built an impressive organisation called the Human Development Foundation that operates 33 kindergartens, providing over 4,500 slum kids, ages 3 to 6, their first lessons in reading, writing, Thai folklore and history, song, dance, sports, religious celebrations, and more. The central facility, or Mercy Centre as it's known, also gives slum kids a place to find refuge from the streets when their parents are at work and also houses the biggest HIV/AIDS hospice in Thailand. The Bangkok arm of our sponsor Aberdeen Asset Management wanted to do a press event while the expedition was in town, as well as tie-in to a local cause for the long term and make a donation of 300,000 Baht (around $8,000 USD) in the short term. It made sense to find a similar organisation and cause as the Rumah Solehah in Kuala Lumpur where we also initiated what will hopefully be a long-term financial support arrangement. And somewhat by accident - reading a story about Father Joe in the book 'Thailand Confidential' by Bangkok ex-pat Jerry Hopkins - I stumbled across the inspirational story of this man and his nondemoninational devotion to the plight of the poor in Bangkok's biggest slum. Now and then I meet what I would classify as a real hero or heroine on this trip. People that have truly transcended living a mediocre life and are doing something worthwhile that needs fixing. So once again it was a true privilege to visit such a facility and meet these amazing children who are either living with very little, or have very little (time) to live. Those who have full blown AIDS know they are sick and are going to die once the medicine ceases to be effective. But you wouldn't know it from the video images. Was asked by Jason to do a bit of a write-up about who I am and what-in-the-world I'm thinking of when I asked if I can actually join the expedition. I'm Melissa Mak, 25, Singaporean Chinese. I am/was with Outward Bound Singapore as an instructor for the last 3 years. While I was at OBS, it occurred to me that while I was in the line teaching all about adventure, I had never quite had one before. The ones in university where I went New Zealand and Australia are pretty much “safe” since everything's easy to get in and out of, locals speak your language and kind of like... comfortable to me. I think that whatever I had teach/preach before was not quite complete somehow. And so late last year, I actually saw this poster that one of my colleagues put up in the office all about Jason Lewis from Expedition 360 doing a talk with one of the adventure clubs in Singapore. I totally missed it due to work (as usual) and instead wrote to Jason about cycling in Africa (a leg yet to be completed). Why Africa? Not because it has boundless safaris, lions and cats that kind of thing; but to really see for myself how do people there live. You know how there's always stories about starvation, strife and wars in Africa on the media. I wanted to study public health as my Master degree, so it made sense that I did try to get to know this place at least. Anyway, my 3 years contract with OBS was on its way to completion. I had oodles of leave to clear (around 3 months) and so I packed up my bags and bike to come along. Everyone was great when they heard that I was going on this expedition. My aunt, who lives in the same apartment block, went out of the way to get me an amulet. Belinda, my colleague, loaned me her tent and sleeping bag. Johann (of the 1st Singapore Transcontinental Cycling Expedition and Everest 98) loaned me his spanking brand new bike panniers! There were the many people who took time out just to see me off by organising the parties. I even caught 2 of my close friends who were working in Shanghai before I left. Had lots of nothing but good luck since I decided on leaving to do this whole expedition. Won some cold hard cash from a gameshow. Yes, I should have listened to Jane (my hostel mate back in university) and not gone into OBS, but turned into a professional gameshow winner. Won enough for holidays in university, buy stuff and all that jazz. I consider Catherine Hartley (the 1st British Woman to do North and South Pole) as my biggest source of inspiration. Imagine her definition of herself - a media bunny doing all that trekking in the world's coldest and remotest areas! A good friend of mine, Teo Yenkai, summited Everest himself with the NUS Centennial attempt too. We're pretty much the same in terms of our character, so I suppose whatever he's got built into him, I've got it too. So lets see what's new. A quick thanks to Tracy Swedlow of Interative Television Today who dug up some pertinent info on dogs and the Buddhist faith in Thailand following the penultimate vlog report. 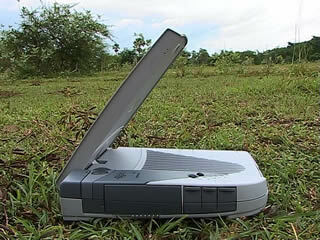 Today's vlog explains a little about the method by which we're delivering these vlog reports from the field. 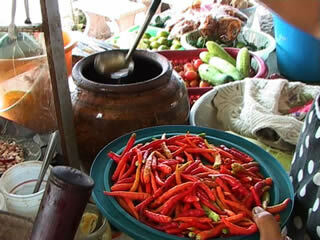 Will give an update on Bangkok and details of a new mystery team member who has just joined up in the next posting. When I turned up at the airport yesterday evening to meet her off the plane I was quite surprised she actually turned up (I thought she might bottle out at the last minute). If she can make it this far I reckon she can make it to Kunming in China where we'll take stock of how things are going. Arrival through the intestinal tract of any capital city is a chaotic and stressful affair. In the case of Bangkok the traffic started to get crazy about 40kms out and got progressively more dangerous. The trick to biking in heavy city traffic I think lies with riding aggressively but defensively. Kind of like gatecrashing a big party but with an eye over one's shoulder to make sure the bouncer doesn't clobber you from behind. The one habit that drivers in SE Asia share alike, whether from East Timor, Indonesia, Malaysia or Thailand, is the unequivocal consistency they have of pulling out from minor roads into a main highway without so much as a glance to see what's coming. In Malaysia I counted five accidents in one morning alone of moped riders that had been hit on the right side (they drive on the left side of the road here). When I asked my friend Norsiah in Pulau Pinang how this was so she replied that it was part of the mentality in this part of the world where 'everything will just be OK'. A kind of 'Hakuna Matata' - no problems! 'But what about the inescapable law of physics that determines that if a large steel object - like a bus - is heading towards you at high speed without the ability to stop quickly then one will be converted into highway pizza pronto?' I replied. It reminded me careering down the switchback roads of the Guatemalan highlands at breakneck speed in a clapped out public bus, all regard for the physics at work of keeping the damn thing connected to the mountain thrown to the wind by a kamikaze driver who held all faith in an icon of 'Our Lady of Guadelupe' glued firmly to the dashboard. Suicide to the western mind, but to the locals - a perfectly acceptable level of life insurance. Something that has struck me as a little strange is how, as Buddhists, the Thais treat different animals with differing levels of respect. I passed an anthill earlier today that had a little shelter built around it, presumably to protect it from the elements (probably sets the delicate micoclimate inside into a spin not having sufficient water and sun exposure!). It even had a red and white ribbon around it - for what purpose I have no idea. But it all looked 5-star super delux Hilton standard for the ant family at Ant Hill Corner. By contrast the dogs, which to my mind must rate higher on the evolutionary ladder than ants, at least in terms of brain size and intelligence, are the most decrepid bunch of four-foots I've seen of all the countries visited by the expedition so far (and I've seen some pretty mangy mutts in Central America and Indonesia). But aren't Buddhists supposed to be compassionate and kind to all living creatures? Perhaps this lack of attention explains why they are also the most aggressive. Out of the front yard of every 4th or 5th house I can expect a blur of snarling teeth and raised hackles to come barreling out after the bike. It got so bad a few days ago in the small villages that I gave up riding on the small coast road altogether and took the busier, but less dog-infested, main highway up to Bangkok. Tonight finds me in the town of Samut Songkhram, just 65kms west of Bangkok. It's a pretty barren satellite town with not much to offer, except one interesting piece of history. 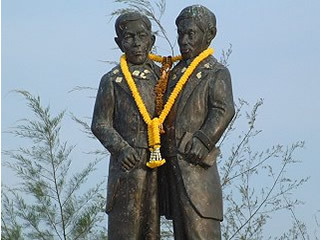 This is the birthplace of Chang and Eng, two local Thai males who were born fused at the breastbone by an 8cm length of ligament (otherwise having separate organs). They were 'discovered' by an American in 1814 and shipped off to tour the world as 'The Monster' in freakshows mainly in America and Europe. It was their origin here in Thailand, then called Siam, that prompted the term 'Siamese Twins' first being coined. 'Lil bit of trivia for ya! And on the subject of dogs, anthills and Buddhism, I'm sure it's just my position as an inquisitive but ignorant outsider with very little grasp on the culture that is the real explanation.